By Yitzchok Singer. To any observer, this is clearly a perfect shidduch, a “match made in heaven,” bringing together the largest mosad hachinuch in the Diaspora – and perhaps the world – and the most prominent philanthropist of our time. 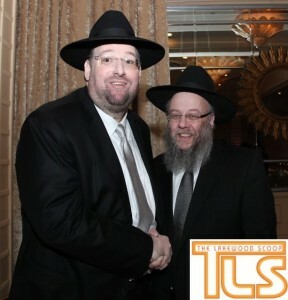 Living up to his magnanimous reputation, and in yet another gesture of astounding generosity, Reb Shlomo Yehuda Rechnitz of Los Angeles has stepped forward to dedicate the newly-completed Vassar Avenue building of the Lakewood Cheder in Lakewood. It is no wonder that Reb Shlomo Yehuda, one of our generation’s most beloved and recognized philanthropists, askanim and baalei tzedakah who is known to “think big” in his desire to help Klal Yisroel on a communal and individual level, has chosen to attach his name to one of the largest construction projects ever undertaken by a mosad hachinuch anywhere in the world. Known to one and all as “The Cheder,” the Lakewood Cheder has long been known as one of the largest and most well-respected frum elementary schools in the world. Now, this leading mosad will have a home that will be the largest of its kind anywhere. Incredible siyata diShmaya has seemed to follow the Cheder at each phase and stage. Three years ago, it took no longer than twenty weeks from the beginning of construction until the new building on Vassar Avenue was ready for the seventh and eighth grade division to occupy it. An area covering 30,000 square feet, this section houses 15 classrooms, 8 tutoring areas, and a 10,000-square-foot dining room/bais medrash. In Phase II of this historic project, 44 classrooms – 11 per grade – were constructed. A creative and perhaps revolutionary feature of this phase is a completely secure 16,000-square-foot outdoor two-story playground that is secured surrounded on all sides. The primary and first grades have their own wing on the first floor, with tutoring rooms and other amenities. On the same floor, the fifth and sixth grades have their own section as well. In Phase III, classrooms for the second, third and fourth grades, as well as a separate dining room for those grades and a gym, were constructed. The sheer size of the building blows one’s mind. The Cheder building, which will proudly bear the name of Reb Yitzchak Tzvi A’H Rechnitz and YBL’C, his Aishes Chayil Rivka, Toishvei Ir Lakewood from אי׳שת to כ׳שת will proudly serve as a daily home-away-from-home for 1,900 students, and the campus leaves ample room for the natural growth of the school over the next several years. The Cheder has taken on a daunting financial burden to make this mammoth project possible. After purchasing the Vassar campus for $6 million several years ago, $1.8 million, $6 million and $5 million were spent, respectively, for the three phases of the campus construction. When the naming of this breathtaking building was made available, it was Reb Shlomo Yehuda Rechnitz who wasted no time in expressing his desire to capitalize on this unique opportunity. As he has done in the past, Reb Shlomo Yehuda, a visionary baal tzedakah who has raised the bar on chesed in our times, stepped forward with an unprecedented donation. He recognized the unparalleled nature of the Cheder’s new building. Reb Shlomo Yehuda has rewritten the book when it comes to contemporary charity-giving. Among many other positions of leadership, he serves as chairman of the Chofetz Chaim Heritage Foundation. Over the years, he has made historic financial contributions to such well-known institutions as Yeshivas Mir Yerushalayim, the Kamenitzer Yeshiva in Yerushalayim, Yeshiva Torah Vodaas, Bonei Olam, and Torah Umesorah’s Sandy Relief Fund. Reb Shlomo Yehuda is also the president of Yeshiva Toras Emes of Los Angeles and the International Board Chairman of Bonei Olam. Reb Shlomo Yehudah, a son of Reb Yaakov Rechnitz and a son-in-law of Rav Yisroel Belsky, rosh yeshiva of Yeshiva Torah Vodaas, has spent years in the healthcare and medical supply industry, using his hatzlachah to better the Torah world, both in his local Los Angeles community and beyond. The 43-year-old, as a bochur, attended Mesivta of Long Beach in New York and then Yeshiva Mir Yerushalayim. In 1998, he incorporated TwinMed, LLC in Los Angeles with his twin brother, Yisroel Zev. Until today, they work and contribute Tzedaka together. Reb Shlomo Yehuda spends half of his day overseeing the Shlomo & Tamar Rechnitz Charitable Foundation. He and his wife distribute funds to over 1,100 institutions yearly and he is known in the Los Angeles area for opening his home every week to listen to the needy and to hand out tzedakah. On August 1, 2012 Reb Shlomo Yehuda was honored as the keynote speaker of the 12th Siyum Hashas of Daf Yomi at the MetLife Stadium in New Jersey. While most of Reb Shlomo Yehuda’s gift-giving is performed away from the limelight, one particular incident demonstrates his unending compassion and sensitivity. In 2012, Reb Shlomo Yehuda heard about Diane Aulger, a mother of five in North Texas who had her labor induced few weeks early so that her husband could meet their daughter before he died from pulmonary fibrosis. Upon hearing the story, Reb Shlomo Yehuda personally phoned Augler himself and sent her $20,000. Such stories are commonplace, say Reb Shlomo Yehuda’s friends. “But he makes sure no one finds out about them,” they say. The larger donations he has given to mosdos haTorah and chesed organizations combine with the donations he gives thousands of individual petitioners each month to make Reb Shlomo Yehuda a chad bedara, a once-in-generation philanthropist. Many of the individuals who fill his waiting room, and fill his answering machine and e-mail inbox with pleas for help, don’t know him, even after their requests are answered. He’s content to make a difference and then step back. Rabbi Berish Goldenberg, menahel of Los Angeles’s Toras Emes who serves as the administrator of Reb Shlomo Yehuda’s tzedakah funds, estimates that between e-mails, text messages and voice mail, Reb Shlomo Yehuda receives more than 50 requests for help each day. Sunday mornings see Reb Shlomo Yehuda sitting in shul, receiving over 500 local indigents, frum and not frum alike. Each one receives a gift card to the local grocery. His generosity to several local and national charities – such as his unsolicited financial aid to widows of fallen police officers, local and national hospitals, health funds and military families, for example – have engendered great kiddush Hashem. The attitude that money is meant to be shared has influenced many others to follow in Reb Shlomo Yehuda’s footsteps, and a new generation of working bnei Torah look to him as an inspiration. With his momentous dedication of the Lakewood Cheder Vassar Avenue building, Reb Shlomo Yehudah has once again blazed the trail, setting new standards for tzedakah and philanthropy, showing that giving of his own resources for the honor of Hashem and His Torah is not something he does, but who he is. There are 19 Comments to "Reb Shlomo Yehuda Rechnitz Dedicates The New Vassar Avenue Building of the Lakewood Cheder"
Thank you so much! What a Zechus you have to be able to support such an amazing mosad! Tizku Limitzvos Reb Shlomo Yehuda! thank you .what a zechus ! Simply put. This man is amazing. May HKB”H only grant him parnassah, nachas from his family and good health “ad meah viesrim”. Thank you for showing us all what true tzedaka is all about. what a kiddush Hashem!! Amazing!! A true zchus he has. I’m jealous. He should have nachas from his new 1900 children! A true tzaddik, may hashem grant you good health,arichas yomim and much nachas from your children. Reb Shlomo Yehuda has the insight to realize that the Cheder Bais Faiga is a role model for all of lakewood.Thank you for being there for klal yisroel. Thank you shlomo z for arranging this! I don’t understand what would move someone to “thumbs down” a comment that says something simple as “Thank you. What a Zechus!”? I find it admirable to see someone donate money to an elementary school of a different city. Just think of the many excuses one can come up with, as why one doesn’t have to support a school in another city. Yet, the donation not only helps the school, it also lifts a burden off all the parent body, who otherwise would have had to help raise those funds. Oh Wow – How nice. Can they use any of these funds to fix the bussing mess. It’s 6:30 and my 1st grader is still not home from school. He was also not picked up in the morning the last 2 days. Can someone explain why he couldn’t have just said, all kids in schools this year and then comes my money? Thank you R’ SYR. Everyone likes to talk about and complain how terrible it is that children don’t get into school in lakewood. We dont appreciate the mesirus nefesh of Rabbi Posen who instead of saying the cheder is big enough the doors are closed-he continues to add classes so there can be 50 less children that arent sitting at home now with no school. I have a great idea, yankel. get yourself off the stupid internet and go pick your kid up from school. that simple. sheesh. Does any know his email address? I loved the old building on 9th and Madison!! great memories!! !